IN BLACK AND WHITE. 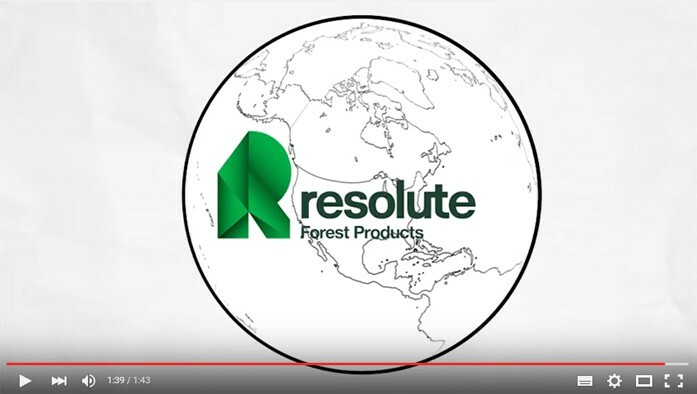 At just under two-minutes long, the video starts with an explanation of what and where the boreal forest is and how we only harvest in certified parts of this vast resource. Using a simple back and white animated illustration style, it also explains that five times more forest is lost to fire, disease and insects than is harvested annually, and that responsible harvesting means not only reforestation, but also ensuring biodiversity. JUST THE FACTS. We’re sharing this video with our employees, partners and colleagues because this is one of the best ways to deliver the facts. These types of videos have grown increasingly popular due their ability to offer a clear perspective on a topic while providing detailed information. We punctuate the video’s animation with bold, green text that offers up facts – like how forestry makes up at least 50% of the economic base in 200 communities, and that Resolute contributed some 65 million acres (26.3 million hectares) to protected land in Ontario and Quebec. ATTENTION GETTING. Whiteboard videos have been found to outperform ordinary videos in memory tests and tend to hold a viewer’s attention as they anticipate the black and white illustration coming together. They’re also easy to share. Click on the link below and see for yourself.